Canadian dollar bulls open a new week having been crushed by Friday’s economic numbers. And they're likely to get little support from the Bank of Canada when it releases its mid-week rate decision. The loonie tumbled Friday when Statistics Canada reported a mild contraction in gross domestic product in December and exceptionally weak fourth-quarter economic growth at an annual pace of just 0.4 per cent. Adding a little spice was the fact that, as The Globe and Mail's David Parkinson reports, the federal statistics agency accidentally released some of the key numbers before the set time, meaning the loonie sank earlier than it otherwise would have. Economists don't believe the current quarter is shaping up to be all that great either, for that matter. As Bank of Nova Scotia currency strategists put it, the loonie bulls got "slaughtered" by the "awful" fourth-quarter measure and ahead of the Bank of Canada's rate decision Wednesday, when it's expected to hold its benchmark at 1.75 per cent in this soft economic climate. The currency's fortunes will rest on what the central bank says in its accompanying statement, specifically in what it suggests for its rate path, as higher rates make the loonie more attractive. 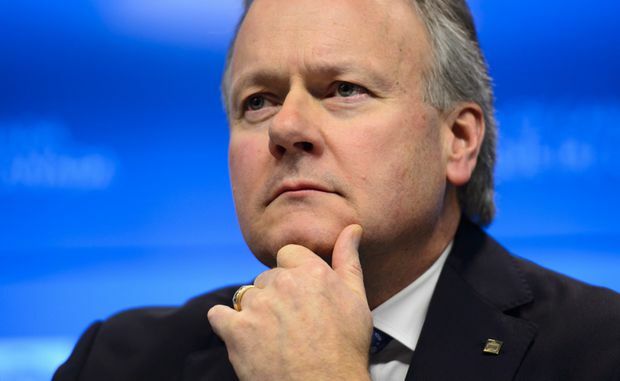 Governor Stephen Poloz and his Bank of Canada colleagues have signalled a pause in their rate-hiking cycle, but have still suggested that the benchmark will have to rise down the road. Observers, meanwhile, have scaled back their expectations for increases, some even suggesting the central bank may have to trim its key overnight rate. So the tone of Wednesday's statement, and a speech to a business audience Thursday by central bank deputy governor Lynn Patterson, will be widely watched. "A BoC hold is widely anticipated on Wednesday and the statement tone will need to balance the recovery in crude prices and the moderation in global growth concerns against a weaker domestic story," said Shaun Osborne, Scotiabank's chief foreign exchange strategist, and his colleague, strategist Eric Theoret. "The bank's cautiously optimistic message is at risk, however the characterization of growth will be key as policy makers speak to their outlook," they added in a report on Friday's loonie action. "BoC deputy governor Patterson's economic progress report will be critical." Benjamin Reitzes, Bank of Montreal’s Canadian rates and macro strategist, expects the central bank to “sound a bit more cautious” this week. "However, don’t expect Poloz to be overly negative as growth is expected to rebound in Q2," he added. "Given the weaker growth backdrop, with the trade and housing uncertainties unlikely to be resolved, we look for the BoC to be on hold through most of this year." Capital Economics, in turn, believes the central central bank is done raising rates and, indeed, will have to backtrack on its earlier increases. "Despite Poloz’s pledge, we do not expect any more rate hikes in this cycle," its economists said in a report. "Market pricing implies that investors agree, although they have yet to come round to our view that the bank's next move will be a cut. We’ve pencilled this in for the end of the year." And thus it becomes a key period for the Canadian dollar. Scotiabank's "fair value estimate" puts the loonie versus the U.S. dollar at just over 74 US cents, and "reflects the tug of war between supportive commodity prices and a bearish outlook for relative central bank policy." Besides interest rates, crude prices can be key to the loonie's value given the importance of oil to the Canadian economy. The currency is “in a vortex,” said analysts at Bank of America Merrill Lynch, who recently revised their forecast for the loonie, which they now expect to sit at about 73.5 US cents at the end of the year. This new view, from Carlos Capistran, the bank’s Canada and Mexico economist, foreign exchange strategist Ben Randol and rates strategist Olivia Lima, is based on expectations of a “contentious” path to bringing the proposed new North American free trade pact into force, which will speed up capital outflow from the country. But also at play is the possibility that central bank rates in Canada and the U.S. could diverge further. “Over all, with Canada being vulnerable to multiple negative shocks and given the continuously deteriorating balance of payments flow backdrop, we believe that the exchange rate – needs to adjust further,” they said. Newmont Mining Corp. has rejected Barrick Gold Corp.’s hostile takeover bid, proposing instead that the two strike a joint venture for their assets in Nevada. And, Newmont said, it will push ahead with its takeover of Goldcorp. Newmont rejected the “all-stock negative premium proposal” as not in the best interests of it shareholders. The joint-venture proposal would see Barrick hold 55 per cent, and Newmont 45 per cent. “Newmont has consistently expressed to Barrick that we are open to a joint venture for our operations in Nevada,” Newmont chief executive officer Gary Goldberg said in a statement. The focus shifts to Beijing and the 13th National People's Congress. "This is the largest annual political gathering," said analysts at Citigroup. "We expect Chinese Premier Li Keqiang and Finance Minister Liu Kun to deliver overall economic growth targets," they added. "The legislature is also scheduled to review a draft law protecting the intellectual property of foreign investors and banning forced technology transfers, which are two of Washington’s key demands in its trade dispute with Beijing." And it's always worth watching what Australia's central bank has to say, particularly given the similarities in the Canadian and Australian economies. The Reserve Bank of Australia is expected to hold its key rate at 1.5 per cent, having already warned of global trade threats. "The country did well during the commodity supercycle and benefited greatly from China’s enormous appetite for minerals," said CMC Markets analyst David Madden. "Now that China appears to be slowing, Australian growth has also cooled," he added. "The RBA trimmed rates in recent years to adjust to the slowdown in growth, but that sent house prices in Australia’s major cities sky high. House prices have fallen in the past year so a rate hike is the last thing the Australian property market needs, and the RBA is all too aware of this." Also on tap are quarterly results from Aecon Group Inc. and Great Canadian Gaming Corp.
Aside from the Bank of Canada, the biggies are the Canadian and U.S. trade reports, which are always interesting in this era of new American trade policy. Economists generally expect expect Statistics Canada to report the merchandise trade deficit narrowed in December to $1.8-billion, from November's $2.1-billion, but some see it swelling instead, possibly hitting $3-billion or even topping $4-billion. They expect the U.S. report to show a fatter deficit of about US$57-billion. The European Central Bank is expected to hold the line amid the region's bleaker economic climate. "Interestingly, [last] week’s data actually had a better tone, such as a rebound in German retail sales and France’s consumer spending," said BMO senior economist Jennifer Lee. "But this won’t change the ECB’s tone when it holds its monetary policy meeting." Corporate earnings: Cara Operations Ltd., Descartes Systems Group Inc. and Dorel Industries Inc.
"It’s been quite the run for jobs in Canada, surging 234,000 in the five months to January, the best spurt since 2002," said BMO's Mr. Reitzes.